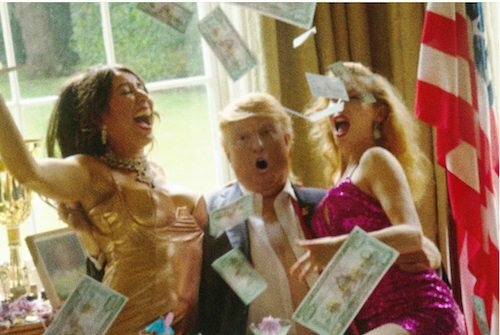 Donald Trump’s style of governing has captivated and consumed the visual culture, along with almost all political discourse and other moderately important aspects of modern life. Memes, art movements, late-night comedy shows, museum exhibitions, and even Super Bowl ads have been flavored by the 45th president’s policies and character. After his first week in office — which came with a controversy surrounding pictures of the crowds at Trump’s inauguration and the emergence of the term “alternative facts” — we could already sense that photography would be important in understanding the presidency of a man who is beguiled by imagery — especially imagery of himself. Now it’s time to look back at President Trump, month 1. 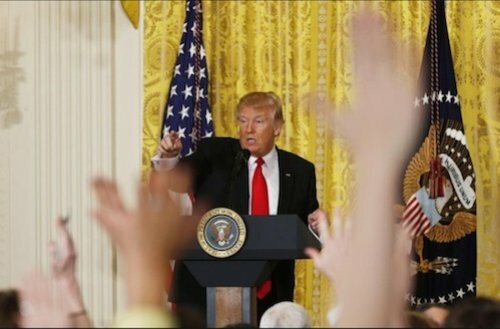 Reuter’s collection of photos track Trump’s chaotic first month, which included a report that his aides couldn't find light switches in the White House, the reversal of his anti-immigration executive order by a federal court, the firing of his national security advisor, who withheld information about contacts with Russia, and a bizarre press conference (see item 8). For another perspective on President Trump’s first 100 days, you can also go to 100 Days in Appalachia, a project from West Virginia Public Broadcasting and WVU Reed College of Media. The project’s goal is to tell "the political, economic and human stories of communities that are more complex than national narratives have allowed” through the eyes of all sorts of people who live in Appalachia, the epicenter of Trump country. 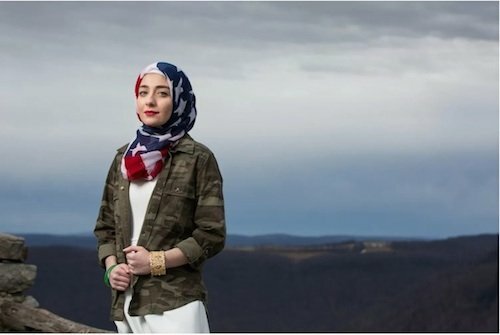 One of the people you’ll meet is Sara Berzingi, whose family came to West Virginia from Kurdistan as refugees. Michael Shaw’s Reading the Pictures website provides another viewpoint on Trump’s first month in office. Shaw examines news images to discern underlying media story lines and political agendas that go beyond daily headlines. He has recently looked at images of the president handling a North Korean missile crisis while dining with friends at his Mar-a-Lago estate in Florida and a photo taken during Trump’s phone-call meltdown with Australia’s prime minister. Another post from contributor Christa Olson dealt with the president’s bigly concern over the size of things, from crowds to hands. “What has struck me, however, is that President Trump is not the only one who has turned to magnitude in order to visualize the meaning, purpose, and effects of his presidency,” Olson writes. Trump, a BBF of Twitter, has spawned thousands of memes in the past month. 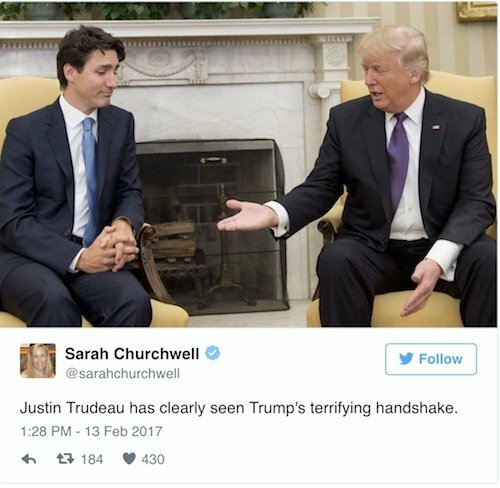 The Telegraph collected a number of memes featuring Trump handshakes, the most awkward of which was the one he and Canadian Prime Minister Justin Trudeau exchanged, sort of, earlier this month. Trudeau has been critical of Trump’s anti-Muslim immigration policies, and a photo of the leaders seemed to capture the lack of comradeship between the two. What is it with Trump and hands? The National Football League likes to wrap itself in the US flag — literally, these days, as most games seem to begin with gigantic 100-yard-long flags being draped over fields during the national anthem. But this year’s Super Bowl offered what Time magazine thought were subtle (and some not-so-subtle) criticisms of President Trump’s immigration policies. Budweiser, for instance, celebrated its founder, Adolphus Busch, an immigrant to the US. As President Barack Obama’s White House photographer, Pete Souza avoided discussion of politics or the idea that his photos conveyed any particular agenda. Now, notes the Columbia Journalism Review, Souza’s Instagram feed has become pointedly political. “He’s served as a virtual photo deejay—mixing images from Obama’s tenure based on the news cycle. Those photos repurpose history as a visual counterpoint and non-verbal critique of the Trump administration’s actions and miscues,” says CJR. 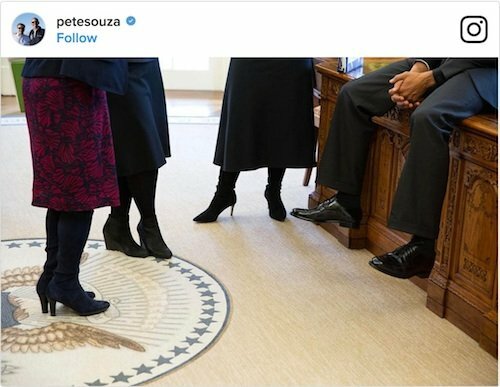 Example: A shot of Obama’s feet, surrounded by the feet of his top female advisors, served as a comment on the lack of gender diversity in Trump’s White House. Donald Trump has been a great president so far, at least for Saturday Night Live. Variety reports that the venerable comedy show recently notched its highest ratings in six years thanks to Melissa McCarthy’s performance as White House press secretary Sean Spicer and Alec Baldwin’s turn as Trump. SNL also launched its first Snapchat show — a three-minute short starring cast members Aidy Bryant and Beck Bennett as a New York City couple attempting to boycott products and services associated with Trump. After his first choice for Labor Secretary bowed out under pressure, Trump held a press conference to announce his replacement. But he barely mentioned the man’s name. Instead he launched into an attack on the press during a 77-minute confrontation with the media that The New York Times called a “free-for-all” and The Huffington Post called “Bats**t” crazy. 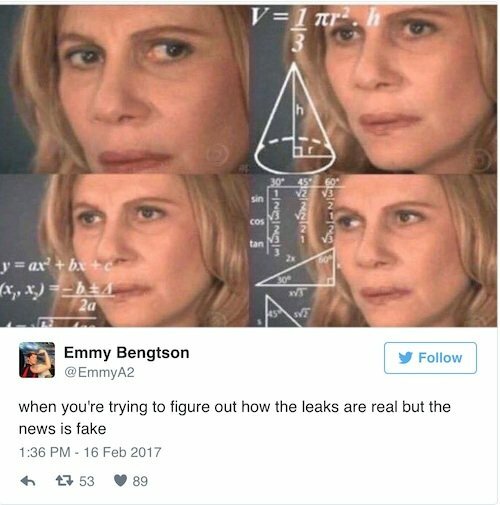 Memes followed: Popsugar collected several pointing out the twisted logic of Trump’s admission that embarrassing leaks coming from the White House were true/not true. “The leaks are absolutely real, the news is fake,” said the president. Find a full transcript at The Washington Post. 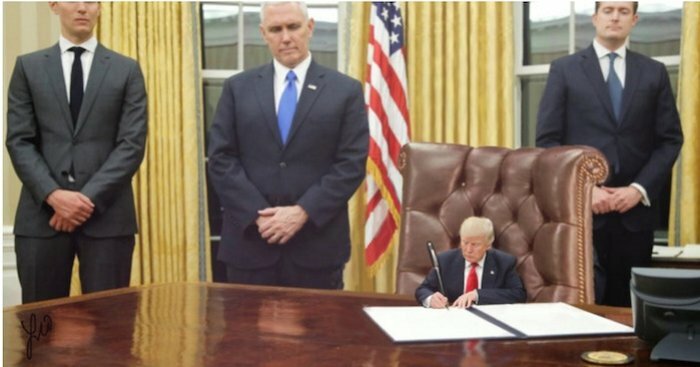 Size matters in Trump’s world: The latest meme craze comes from a subreddit page called Tiny Trump, which features images of a pint-sized President Trump working at his desk, meeting world leaders, and walking with his wife. 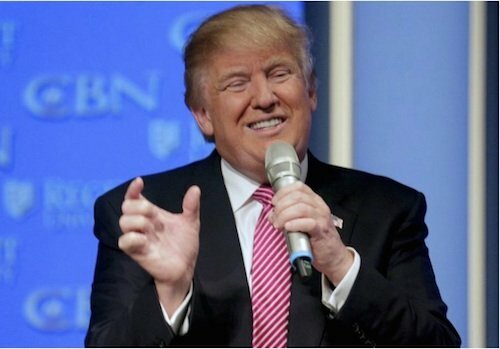 The mischievous memes loop back to Trump’s now famous comments about the size of his hands during GOP debates last summer. Now the YouTube channel Evil Ice Cream Pictures is putting the size meme in motion. The takeaway: Pushing Trump’s buttons with pictures isn’t all that hard. British photographer Alison Jackson is known for her paparazzi-style photos featuring celebrity lookalikes. Her new book Private — which she published herself after publishers turned her away — features a number of pictures of President Trump engaged in various lewd and undignified acts. She tells Hyperallergic that publishers avoided the book specifically out of fear of the litigious president. Her lawyers, too, warned her against publishing the series, which, she says, is meant to raise questions about how media imagery shapes our understanding of public figures.